In addition to test scores and transcripts, all colleges focus on the written materials submitted with each student’s application. There are three (3) main written components with each application: (i) the Common Application essay, (ii) the activities list, and (iii) any college-specific supplemental written materials. The stronger these three (3) written components are (when read together), the higher a student’s chances are of being admitted to the respective college. Each admission decision will come down to the ~15 minutes an admission’s officer spends reviewing each application, and the majority of this short time will be spent reviewing the Common Application essay, the activities list, and any college-specific supplemental written materials. Our Complete Common Application Review service includes the three (3) main written components and helps ensure your child’s application is at its best. Our service includes two (2) full rounds of tracked changes and edits by our expert in-house editing team and our work is backed by a 100% satisfaction guarantee. The cost of our Complete Common Application Review service is only $495. At this point in the process, your child cannot significantly change his or her scores or grades—but your child can help his or her application stand out by submitting compelling written materials. The Common App essay, activities list, and supplemental materials should weave together a memorable narrative and demonstrate to the admissions committee that your child will add value to their college. We will meticulously review your child’s written material, carefully editing the content and providing insightful comments and suggestions. And we’ll help ensure that each element makes maximum impact within the application’s strict word and character limits. Few experiences will have as profound and long-term an influence on your child’s future as the college he or she attends. Allow us to help your child improve his or her chances of gaining admission to his or her dream school through our Complete Common Application Review Service. 1. After you complete your order, you will be immediately e-mailed our common application response template Word documents, where you will copy in the common application essay, activities list responses and any college-specific supplemental written materials. 2. 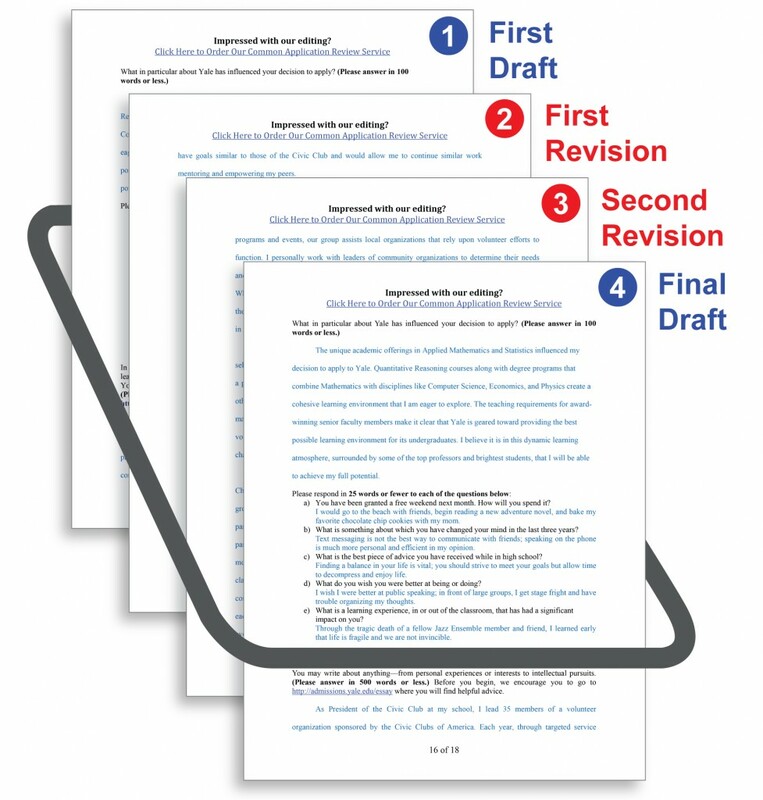 Our editing team will review your first draft documents and provide tracked changes, suggestions, and comments for your consideration and incorporation. 3. After you have reviewed the changes and made adjustments accordingly, you will resubmit an updated revision for a final review by our editing team. 4. Our editing team will provide the third revision and fine-tune word choice, maximize character limits and do a final grammar check. Timing: The entire process should take 7-10 days in total, with a turnaround time of 3-4 days from our editing team for each version.